I have to say that when I first came to writing this Polk Audio Atrium 4 Outdoor Speakers Review, I kept confusing the word ‘Polk’ with ‘Pork’. I was deeply mistaken in my choice of words, and this speaker really does manage to stand out. As you will see in this Polk Audio Atrium 4 Outdoor Speakers Review, this speaker is both reliable and of a high quality and should not just be thrown in with similar alternatives; which, at first glance, you may have done. When you buy a set of speakers like this, you might put them inside your home, or you might place them outside. Regardless of where you place them, it is going to take you some time to either find a location for them to sit, or to mount them on your wall. With all this time investment, you want to make sure they are going to last. As I will explain later, this speaker lasts. You are also probably interested in the range of designs available. This is not a portable option. They are going to be located in the same place whilst you are using them. You are going to want to make sure that their design and looks are versatile enough to suit your needs. Design-wise, the colour choices are limited to Silver and black. The shape is a pretty typical, more cylindrical, design. They have a large speaker accompanied by a smaller, but still vitally important, tweeter. Overall, they are very standard when it comes to this type of speaker. On the outside, the Polk Audio Atrium 4 does not stand out. Aesthetically, they are very basic speakers. 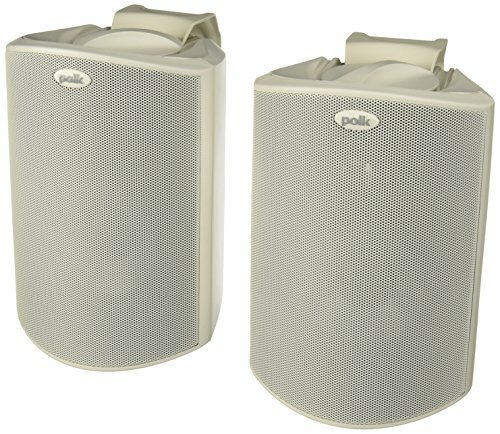 On the inside, however, these Polk Audio Atrium 4 Outdoor Speakers are designed to last. They are made to exceed industrial and military-grade expectations. Because of this, they offer a level of environmental endurance a lot of the alternatives do not. Because of the size (9.5 inches x 7.5 inches x 6.25 inches), you are probably not going to be taking these too many places. Consequently, you may think that the military-grade protection isn’t needed for inside the home. However, accidents do always happen. Moreover, these would be perfect for taking outside to provide a garden party with a musical accompaniment. Surprise rainfalls are not going to leave you scrambling to make sure your sound system isn’t ruined. Technology-wise, the tweeters on these speakers are of a great quality, meaning you can make sure those high frequencies in your music are represented accurately. The main speakers also produce quality sound, which doesn’t tend to decrease as the noise level goes up. The speakers connect through Gold-plated 5-way Binding Posts, meaning you are going to need a more specialised device than just your standard mobile phone or laptop. Again, this highlights that these speakers are more for a professional than the average person. Tweeters – The included tweeters manage to cover between 12KHz and 20kHz, meaning your music will be clearer and of a higher quality when it comes to those higher octaves. Brackets – The speakers come with a patented speed-lock mounting system so you don’t have to spend as much time hooking these up as you might with some of the alternatives. This is great if you want to experiment with their location for the best possible audio experience. Portability – The size means that you are not going to be transporting these speakers conveniently. You will likely move them around the home, but not much more. Moreover, the more professional input method means it might be more awkward to hook then up outside your home. Then again, these probably wouldn’t be your first option if you were looking for portability. Overall, Polk has made a decent effort in producing these speakers. They do have great sound quality and manage to excel in most of the areas they need to. For a set of home or garden speakers, they are a great option. They are durable, reliable and of a high quality. They would make an excellent addition to any home which needs a boost to its sound system. If you are in the market for other patio speakers check out our reviews.